The newly designed Call to Faith website makes it even easier for you to access planning tools, family activities and formation resources. Both Parish and School channels are designed to meet your catechetical and teaching needs. For more information about implementing the Call to Faith program into your parish or school setting, please contact us. 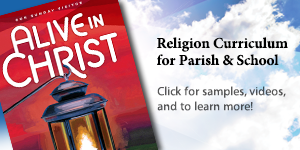 Access convenient online versions of key print materials, catechetical formation and at-home resources, plus an assortment of unique web-based features for parish settings. Note: Current Call to Faith users will need to re-register to access catechist-specific materials. Online resources geared specifically for teachers, administrators and students in classroom environments to help share, connect and live their faith. Note: Current Call to Faith users will need to re-register to access teacher-specific materials. Access resources and sessions supporting each of our Call to Faith Thematic Edition Faith Booklets and Session Leaders' Guides here.